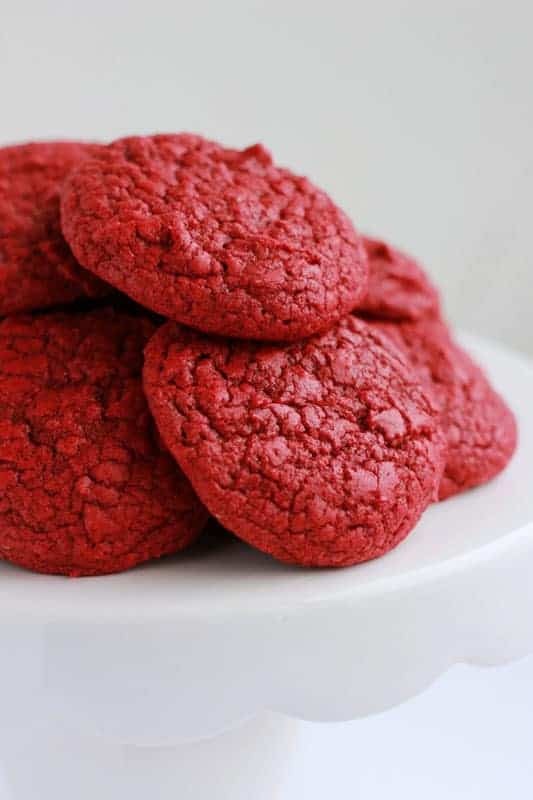 Keep things in the kitchen super easy this Valentines Day with these delicious Red Velvet Cake Mix Cookies! Red Velvet is not stranger here. I have made both a cake and cupcake version within the last year and smothered them in a sweet cream cheese frosting. That pair is like a match made in culinary heaven. 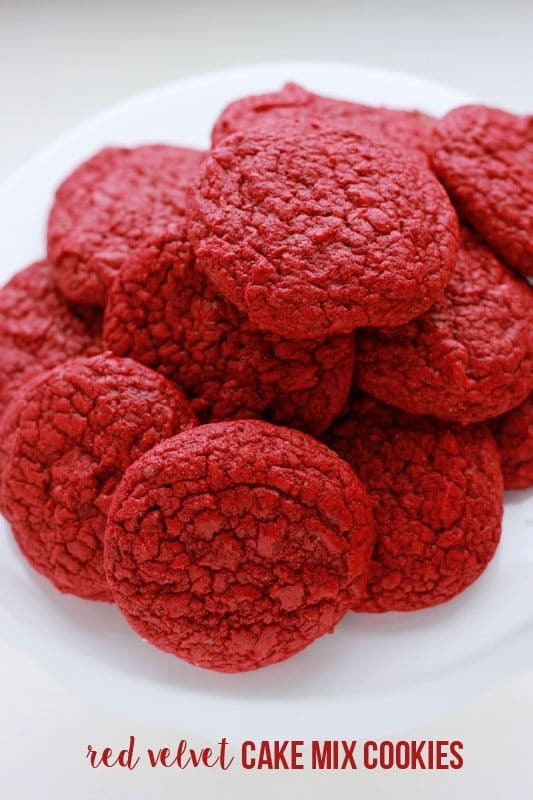 Or at least I am sure I would think so IF I liked red velvet. Lucky for you I have a six year old that is crazy for the flavor which lead me to this modified recipe. 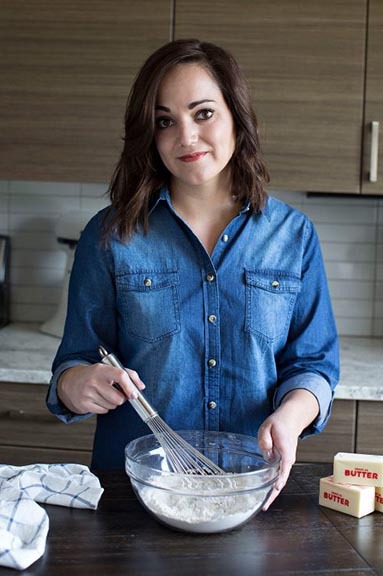 Cake mix hacks are another one of the things you have probably seen all over my site (check out my Strawberry Cupcakes or Hostess Copycat) but never this way. I had no idea you could even make a cookie from a cake mix until my sister begged me to try this recipe she got from a friend. One thing led to another and just like that these little gems were created. I love that you don’t need too many ingredients and they do taste pretty darn good. The bold red color is perfect for the upcoming holiday. Package a few of these up as-is or dip them in a little white chocolate for added goodness. You could even top them with some of that Cream Cheese Frosting I was talking about earlier. Any direction you take it you are sure to win over that special someone. They do say the way to a man’s heart is through his stomach and I am sure that applies to women too. Especially if you add sprinkles. Everything tastes better with sprinkles. I plan to make a batch for my special Valentine as the date creeps closer. He couldn’t help but sneak a few before my photo shoot and declared these “The Best Cookie Of All Time.” Hop over to my Instagram to catch a few behind the scenes photos that show off his awesome bed head. Preheat your oven to 375 degrees. Line two cookie sheets with parchment and set aside. 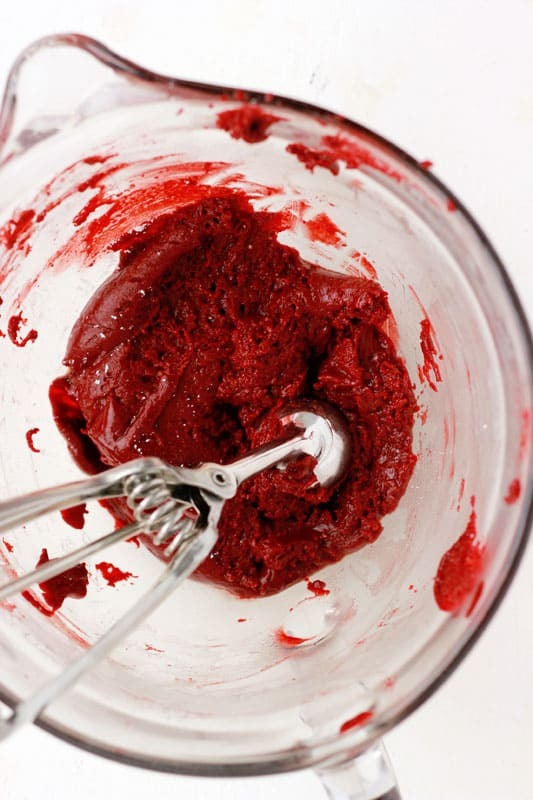 Combine all of the ingredients in the bowl of an electric mixer. Stir until fully incorporated. Using a cookie scoop or spoon drop heaping tablespoon portions onto your prepared sheets leaving 1-2 inches between each cookie. Bake 8 minutes. This recipe for Red Velvet Blondies is the perfect way to combine red velvet cake and blondie bars!